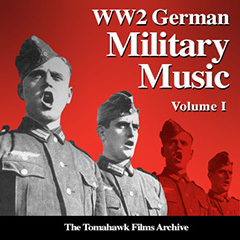 The Tomahawk Film Music Library is available for download as a complete set - all 29 CDs - for only $99.00 USD. Berlin 1945...and scrabbling through the wreckage of bombed out buildings, a young British soldier stumbles across the ravaged hulk of one of the German capital's main Wehrmacht military hospitals; however unlike many of his compatriots intent on looting Nazi medals, steel helmets and flags as souvenirs of war, this young soldier was looking for more interesting booty... and he found it in the shape of a large collection of totally rare and undamaged 78 rpm shellac records buried in the doctor’s mess-room. that we are not affiliated with, nor do we embrace, the philosophies of any radical, political or racist organisations and and that the Germany Kommission fũr Jugendmedienschutz has certified this website to be a serious historical undertaking! © 2018 Westar Music. All rights reserved.